- Publisher Was Jesus a real person? Is there evidence that he rose from the dead? Can we trust the witnesses? Skeptics have always had their questions about Jesus and his miraculous resurrection. The bestselling "Evidence for the Resurrection" pamphlet answers each question and addresses each theory with historical, archaeological, and cultural proofs. A full color, glossy pamphlet presents 12 panels of evidence and logic that has convinced critics over the years and equips believers to point skeptics in the right direction. Perfect for Easter, Resurrection Sunday, discipleship, new members, confirmation, and outreach. "Size: 8.5"x 5.5" unfolds to 33" long. Fits inside most Bible covers." Skeptics' Theory #1 The eyewitnesses hallucinated Skeptics' Theory #2 Jesus did not die on the cross Skeptics' Theory #3 Jesus' body was stolen Skeptics' Theory #4 Everyone went to the wrong tomb For each of the skeptics' objections and theories, "Evidence for the Resurrection" provides an answer from the Scriptures' eyewitnesses, historical Church documents, and ancient archaeology records, among others. The responses cause even long-time believers celebrate the glory of the resurrection with each reading.The pamphlet also includes a one-page answer to the question, "What is the Resurrection?" and a page of "Closing Statements," that includes additional strong evidence of Jesus, and evidence of the resurrection. References for additional reading are also provided. 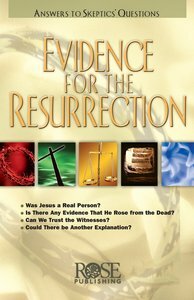 About "Evidence For the Resurrection (Rose Guide Series)"
Was Jesus a real person? Is there evidence that he rose from the dead? Can we trust the witnesses? Skeptics have always had their questions about Jesus and his miraculous resurrection. The bestselling "Evidence for the Resurrection" pamphlet answers each question and addresses each theory with historical, archaeological, and cultural proofs. A full color, glossy pamphlet presents 12 panels of evidence and logic that has convinced critics over the years and equips believers to point skeptics in the right direction. Perfect for Easter, Resurrection Sunday, discipleship, new members, confirmation, and outreach. "Size: 8.5"x 5.5" unfolds to 33" long. Fits inside most Bible covers."